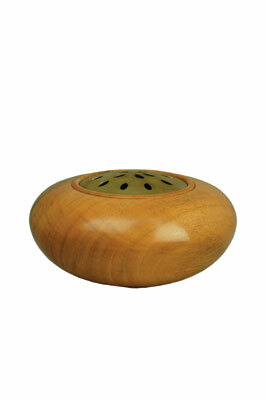 The pomander used to be a very popular item but today is one that we seem to view as more decorative than functional. They can vary greatly in design and size, often simply shaped and yet extremely decorative. Personal vinaigrettes were hung around the neck or from a belt. It could also be something of considerable size that is used to sweeten the scent of an entire room or even a building. If you have never turned a vessel or box then this is a great way to begin, allowing the creation of thin walled vessels for decoration. Turning something a little bit different allows the practice of the techniques without turning at a larger scale. 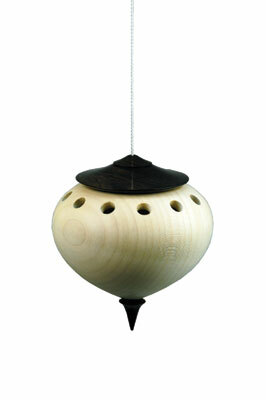 The vessel is basically a hanging box with a slightly loose fitting lid, which allows the wood to move and therefore makes it easy to replace the pomander's contents. 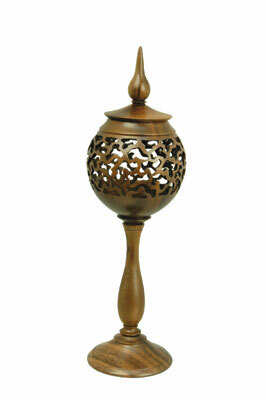 This brass lid pomander is a simple item to create and the finished size of the piece measures 120 x 60mm (4 3/4 x 4 3/4in). 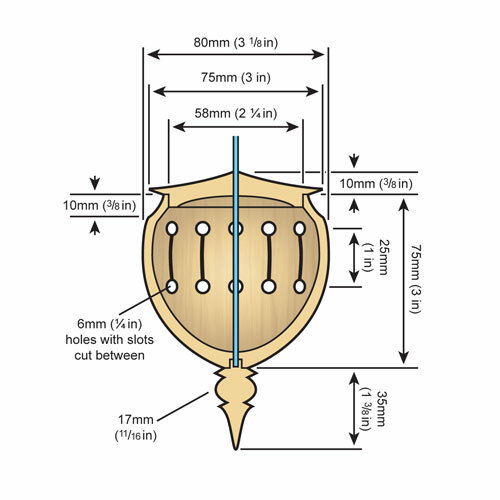 To start turning the pomander, you need to begin by mounting the correct sized blank on a screw chuck. You can then start to shape the outside at the bottom to create a chucking method - I used a small spigot - and you can then sand and seal the turned area. Reverse chuck the piece and finish shaping the top, creating a detail at the opening for the inset top to fit into. 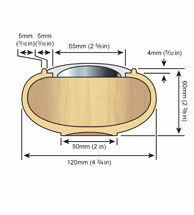 There are many designs and sizes of lid available. 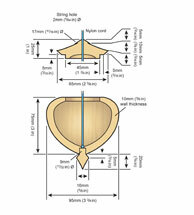 With the opening set begin to turn out the interior of the vessel using hollowing tools or a long-grind bowl gouge. Finally, sand, seal and polish the item using your preferred finish. To create the hanging banksia nut pomander begin by cutting the ends from the nut to create two flat ends, then mount the nut between centres and turn. Decide at what point the nut will be divided, leaving enough material for the natural edge and the spigot; this will act as the union between the top and the bottom. You then need to make round at each end, creating spigots to fit into your chuck before parting in two. Mount the larger piece into the chuck and turn the outside, or alternatively, drill the centre to create the opening. Sand, seal and lacquer the outside, then reverse the piece onto a jam chuck, or if the opening is the same size, use the chuck and it can be held with the jaws expanded. Finish turning and shaping the bottom of the pomander, keeping the tailstock in place as long as possible to add stability when turning. You can then sand and finish the form. Mount the lid into the chuck and turn a spigot to fit into the opening of the bottom previously turned. Drill a small hole at the centre right through the top â€“ this is where the hanging string will pass - you can then turn the top profile and sand and finish as before. With the pieces complete, place a small eye at the inside bottom of the base and tie the hanging cord to it, then pass the string through the hole in the top. Tie a loop at the end of the string and you can then find a suitable place to hang the pomander. the wall and into the inside - this will eventually pass through the lid/top. 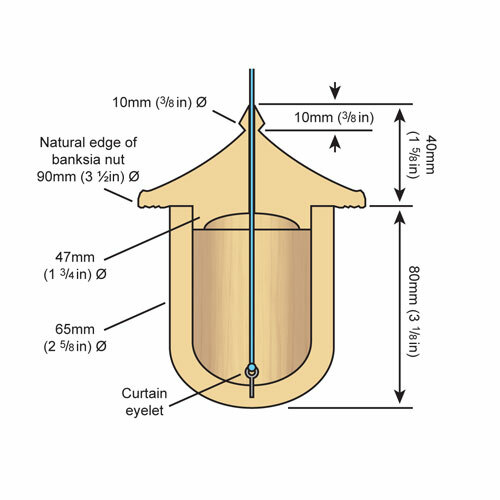 Next, turn the lid, mount between centres and make a spigot that fits the opening of the vessel, then drill to 2mm (5/64in) and dish the centre, then sand and finish. Reverse chuck the top. This can be done by gripping it into a chuck or using double-sided tape. The hole drilled previously will allow accurate centring; you can then turn the top, sand and finish. 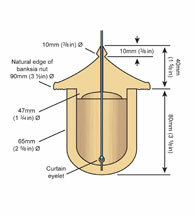 Turn a small finial with a 8mm (5/16in) spigot to fit into the hole at the bottom - this will cover the knot at the end of the string used to hang the pomander. 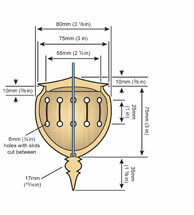 The final dimensions of this pomander are as follows: finial: 20 x 80mm (3/4 x 3 1/8in); vessel: 75 x 90mm (3 x 3 1/8in); and lid: 75 x 20mm (3 x 3/4in). 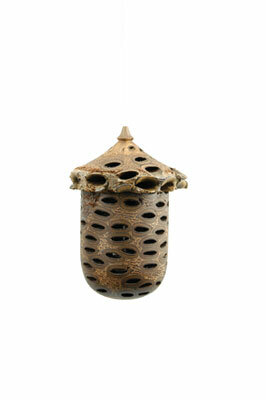 This pomander is made in the same way as the previous one but it has a different decoration applied to the outside. To start, simply mark two lines 25mm (1in) apart then divide it around the circumference by 12. Drill 6mm (1/4in) holes at the top and bottom then, using a small circular saw mounted into a multi-tool, cut vertical lines between the holes before sanding the slots and applying a finish of your choice. 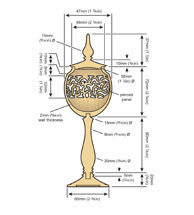 The bottom finial is turned in the same way as before. Drilling it at the centre will allow you to glue the hanging string in place; it then passes through the body and lid as before. 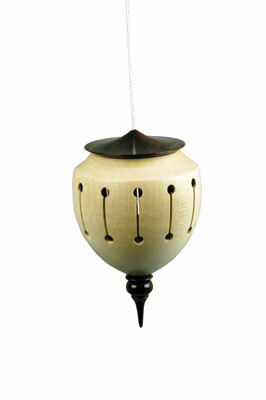 The pomander can now be hung in a location of your choice. 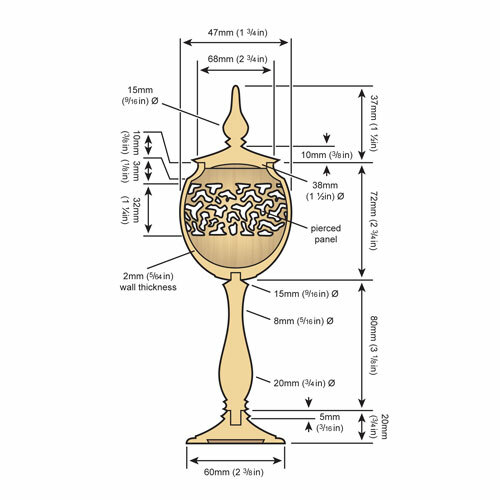 The final dimensions for this pomander are as follows: spindle: 20 x 95mm (3/4 x 3 3/4in); vessel: 70 x 75mm (2 3/4 x 3in); top: 20 x 50mm (3/4 x 2in); and finial: 40 x 20mm (1 5/8 x 3/4in). 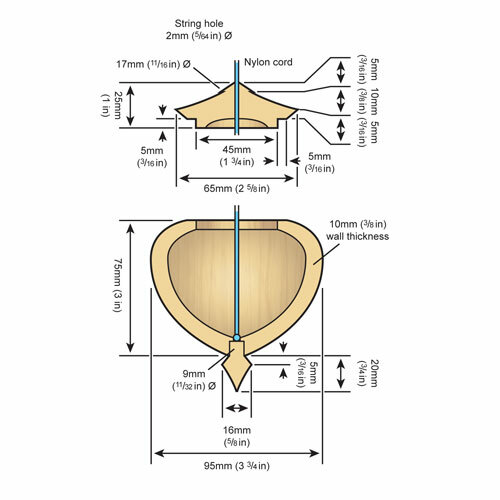 The body of this piece is made in the same manner as the previous items but is turned to a 2mm (5/64in) thick wall; this will be pierced using a piercing bit fitted to a flexible-shaft multi-tool. Mount the base to a scrap wood blank using double-sided tape and turn the bottom with a small dovetail recess before reverse chucking. 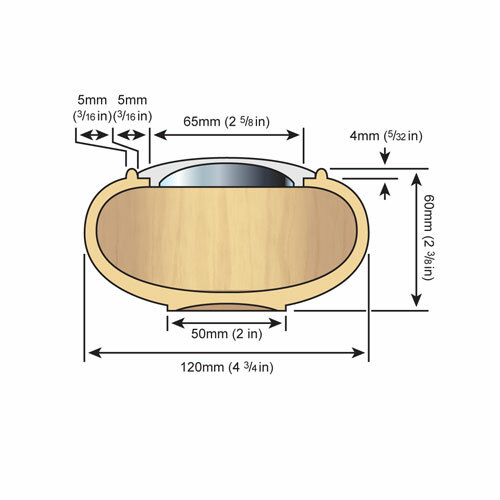 With the top turned, the centre can then be drilled with an 8mm (5/16in) hole - this does not need to go in too far, about 10mm (3/8in) - you can then sand and finish. Next, turn the spindle with spigots at either end, create the details between, then sand and finish. Turn the lid, which can either be turned from a single piece of timber or a disc and spindle - the latter is the more economic method. Turn the top as in the previous items then drill an 8mm (5/16in) hole at the top, which will accept the finial. This hole does not need to go right through the lid. Finally, mount a rod in the chuck, create a spigot at one end and turn the details needed for the spindle - you can then sand and finish the form. When all the components for the pomander are ready, assemble the item using a small amount of good quality wood glue. Allow to dry then add the lid, which should be a loose fit in this case. UK professional woodturner, author and demonstrator Nick Arnull produces decorative turned wood art and also turns spindles for furniture makers, cabinet makers, joiners and builders. 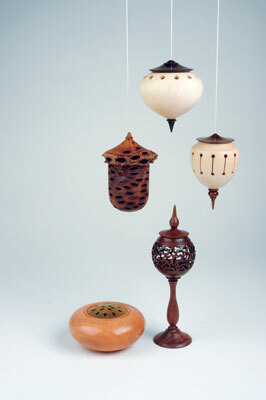 He has demonstrated at symposiums all over the world and also offers tuition to those who are looking to improve their woodturning and explore decorative techniques.